2017 Legislative Recap: Get Your Copy! 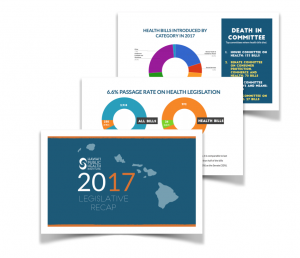 Our 2017 Legislative Recap was created to help advocates and other Hawai‘i residents understand the major health issues discussed this legislative session and how these policies may affect them. With nearly 3,000 bills introduced this year, staying informed can be an overwhelming task. We hope you find this piece helpful and that it inspires you to be an engaged, active participant in the legislative process. Receive updates, quarterly e-newsletters, job announcements, and opportunities to take action. Help make Hawai‘i the healthiest state in the nation with your tax-deductible contribution.